The perfect fall morning breakfast. 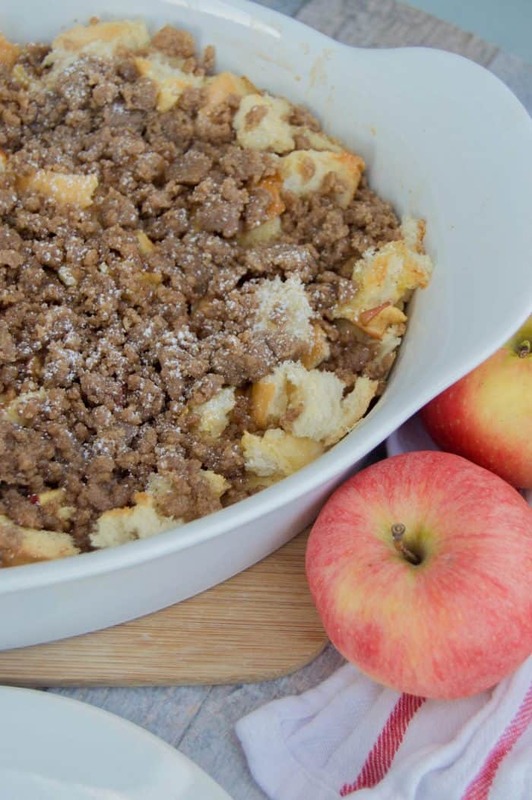 Use up all those apples you picked with this Apple Cinnamon French Toast Casserole. I love breakfast food but I am NOT a morning person. I would much rather get a little extra sleep then have a big warm breakfast. When I can have both though I am one happy mama! 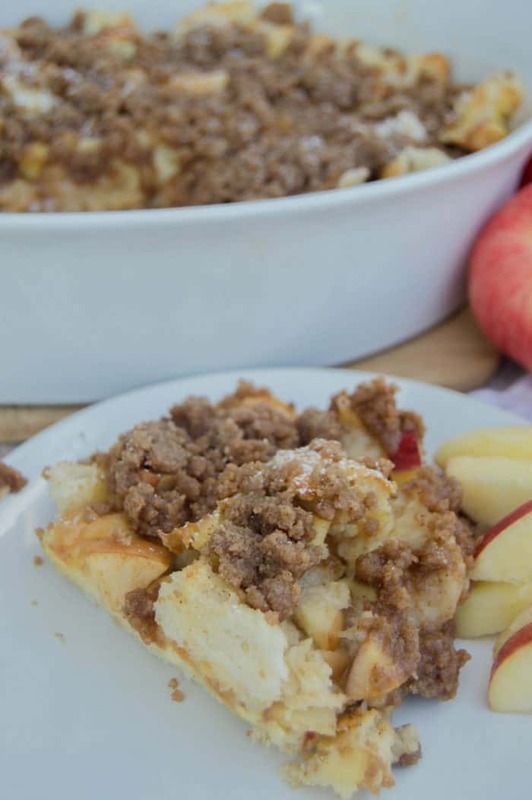 This Apple Cinnamon French Toast Casserole was made the night before (I am much more of a night owl) and then baked in the morning. For this recipe I used a french loaf that I tore into pieces. I diced my apples really small and thin then tossed them in with the bread. Whisk your eggs with some seasoning and then pour it over the bread. I gave mine a really gentle stir to make sure all the bread was coated with the egg mixture. Not pop it in the fridge to bake in the morning. 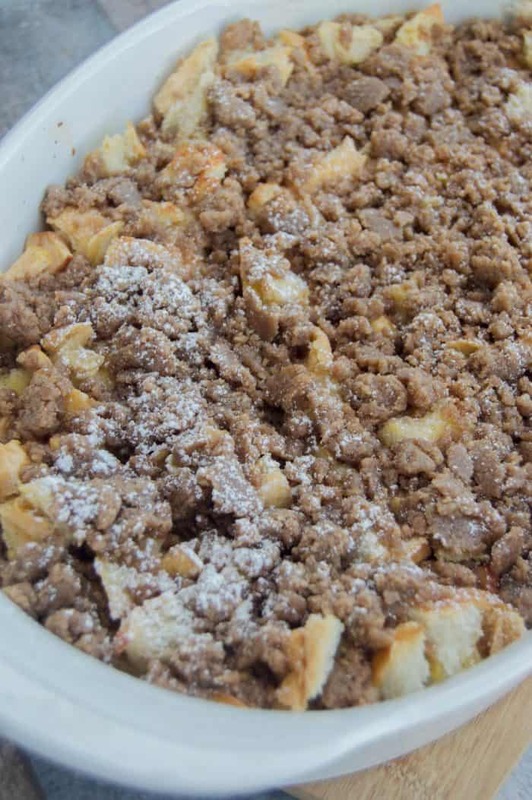 While casserole is baking you can start on the crumble. Top it once baked then pop back into the oven for about 5 minutes. You can serve it with powdered sugar or syrup. 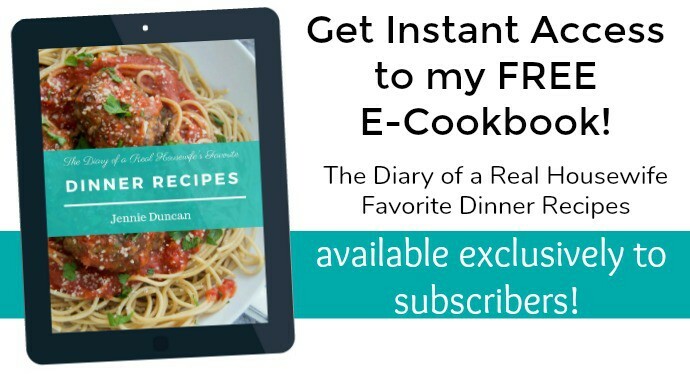 Prepare a casserole dish with non stick cooking spray and set aside. Tear french bread inso small pieces and dice apples to bite size. 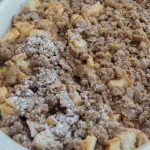 Add bread and apples to casserole dish. Whisk together eggs, milk, cream, sugar, vanilla, and cinnamon. 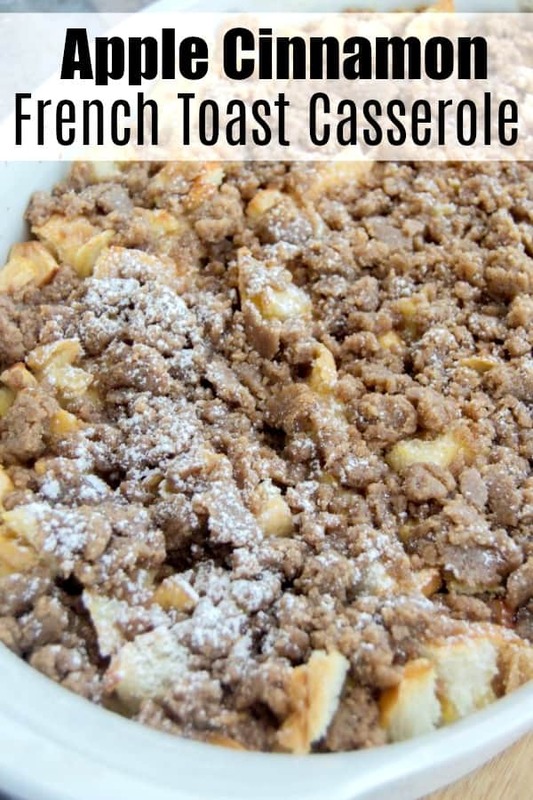 Pour over bread and apples and gently mix until all bread is coated. Place in the fridge overnight. In the morning preheat oven to 350 degrees F. Bake for 40-50 minutes or until cooked through. Meanwhile prepare topping. Dice butter into cubes and add to a mixing bowl. Add flour, brown sugar, apple pie spice, and cinnamon until a crumble forms. Add crumble on after cooking then return to oven for 5 more minutes.